Listening to music, reading a book, taking pictures—all of these are common activities at the beach. Unfortunately, not many devices are built to withstand the water and sand they’ll inevitably encounter there. With the proper gear and protective cases, though, you can hit the beach with your gear in tow and your confidence intact. The best way to listen to music at the beach is to invest in waterproof speakers or headphones. On the speaker front, check out the Grace Digital Eco Extreme ($36.04 on amazon.com ) for personal listening or the Grace Digital EcoXGear ($149.99 on amazon.com ) for a group. 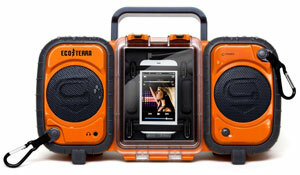 These speakers will hold your smartphone or music player, keeping it safe from the elements and the EcoXGear even floats. For headphones, I’d recommend the Monster iSport Immersion Headphones with Control Talk ($130.27 on amazon.com ). These in-ear headphones seal out water down to 1 meter for up to 30 minutes. There are five different size eartips plus stabilizers to ensure a proper fit. And, if you pick the bright yellow or blue, you won’t accidentally leave them behind. Whether it’s sand working its way under the lens cover or water splashing as you try to capture a shot, cameras are particularly susceptible to beach mishaps. A ruggedized camera, like the 12.1MP Panasonic Lumix TS4 ($269 on amazon.com ), is waterproof all the way down to 40 feet, drop-proof from 6.6 feet and dust-proof—in other words, entirely beach-proof. The Lumix TS4 also takes photos and HD videos that are better than most non-rugged models. 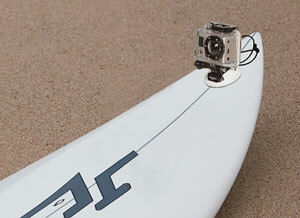 For surfers, you can’t beat the GoPro HD Hero2 Surf Edition ($278.11 on amazon.com ). This 11MP camera has a 170-degree wide-angle lens, can take 10 photos per second in burst mode and shoots full HD video. It's also waterproof down to 60 feet for use off your board. 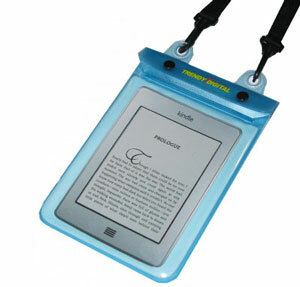 Your best option for reading on the beach is going to be a traditional eReader like the Kindle ($79 on amazon.com ), which has a sunlight-friendly e-ink display. You can easily keep it safe, with the TrendyDigital WaterGuard Waterproof Case for Kindle and Kindle Fire ($15.99 on amazon.com ). For those that plan on relaxing in the shade, there are also versions for the iPad ($19.99 on amazon.com ) and Barnes & Noble's Nook Tablet and Nook Color ($15.99 on amazon.com ). The one device most people won’t leave at home is their cell phone. You can protect it with a waterproof bag, like the TrendyDigital products for tablets, but there are other more elegant solutions. If you’re not going to take your phone for a swim, consider sending it out for waterproofing to Liquipel. For $59, they’ll apply a super-thin, water-repellent nano-coating to your iPhone, Motorola Droid, Samsung Charge or any of a handful of different HTC devices. 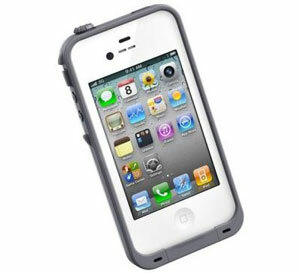 There are also some great, sleek cases like the Lifeproof iPhone case ($79.99 on lifeproof.com). It adds a mere 1.55mm to each edge while delivering water resistance down to 2 meters, drop protection from 2 meters and a full seal against dust and sand. Seriously, except for the tablet bags at $16-20, I can’t see spending that much money for a trip to the beach. I hate heat, so that’s another reason I don’t go! I keep all my stuff in ziploc bags, take them out for those photos, and put them right back in and listen for the zipper sound!!!!! Tahdah - waterproof and sand proof!! And since I refuse to go in water that isn’t chlorinated (almost drowned in the ocean when I was young) - I am the guardian of the electronics way up high on the beach (ok, usually where ever there is shade - or in the club house!!!! And then I use my Canon 30D with a huge zoom lens! And, yes, ziploc baggies also work for water rides at the parks!!! But, I AM going to look into the tablet covers at Amazon! Thanks for that!